Bells Beach, Australia is the next event on the Championship Tour in the WSL. The event window begins on March 28th and continues through to April 8th. As we know the WSL kicked off earlier this month in the Gold Coast and with near perfect conditions it only took less than a week to reveal a winner, with Australian Julian Wilson taking home first prize in yet another Australian to win the Quiksilver Pro. Wilson put together a 9.93 and 7.50 to take down fellow Aussie Adrian Buchan who surfed extremely well to make the Final, only to come up short. It's good signs for Wilson to come up with a win so early in the season. Wilson came storming home in the 2017 season to finish third, but things may have been different if his year started with success. The Quiksilver Pro Gold Coast was an unusual start to the year with many favourites knocked out in the early heats including John John Florence, Gabriel Medina and Mick Fanning, just to name a few. With the tour veterans slumping, we saw a hand full of rookies show why they were given an opportunity on tour this year. Tomas Hermes, Michael Rodrigues and Griffin Colapinto all made the finals and a statement in their first WSL appearance. Mikey Wright was also thrown in the mix after Kelly Slater withdraw the contest with an injury concern. Wright came in with nothing to lose and found himself appearing in the fourth round after taking out Florence and Medina early on in heats two and three. The Quiksilver Pro Gold Coast almost feels like a preseason game, with many surfers not looking totally comfortable and struggling to put together two decent scoring waves. Bells Beach will definitely have a different feel to it and I expect to see the rankings take a 180 degree turn with most surfers putting on a more serious face. As we get set for another Bells Beach contest we sadly will say goodbye to a surfing icon with three time world champ Mick Fanning calling it quits after 17 years on the ASP/WSL tour. Fanning will end his professional career at Bells Beach after taking out the event four times, with his first win coming way back in 2001. His latest Bells victories were back to back in 2014-2015 and then he came very close the next following two years but fell short with a quarter final loss and a semi final loss. Fanning surfs Bells better that anyone and will be pushing hard to have that fairy tail finish. Fanning meets Sebastian Zietz and Jesse Mendes in heat 12 in the first round. 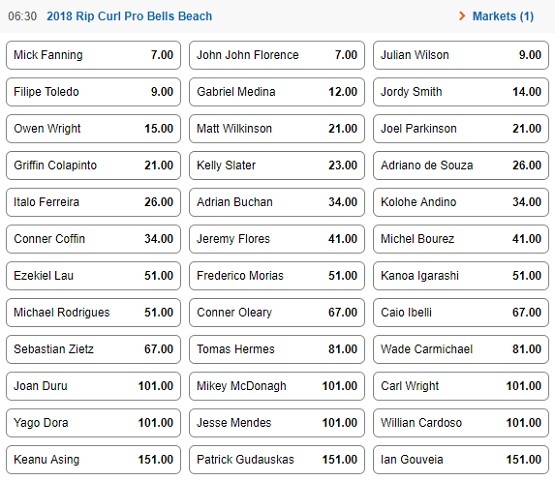 Last year’s Rip Curl Pro Bells Beach we almost witnessed two heavy weights go at it in the Final but Caio Ibelli upset favourite John John Florence in the semi, then had a date with Jordy Smith in the Final. Smith looked comfortable throughout the whole event last year as he won the final with two solid nine point rides. Smith will be back to defend his title after he went down in the third round at Snapper Rocks. Another huge threat to take home Bells is Adriano de Souza who continues to surf well at this event. He has taken this event out once in 2013 and has reached the quarterfinals four of the last five times. He suits Bells very well for his speed, strength and timing. He is a quiet achiever at Bells so definitely keep an eye on Adriano. The Rip Curl Pro Bells Beach is only days away from beginning, so will we see Fanning produce the goods on his final event or will he be upset from someone trying to follow his footsteps? Palmerbet are an Australian-owned sportsbook that are growing in popularity. They present a solid range of sports betting markets and if you sign up through Before You Bet today you can score a massive $500 first deposit sign up bonus!